A nomadic group called Shasu “east/Asia nomad” entered and settled in eastern Nile Delta before 1650 BC. They came peacefully and gradually prospered and increased; then raided and colonized many parts of Egypt. This Shasu created the Hyksos (Egyptian Hekw Shasu, “foreign east rulers”; Greek: Hykussos) were people of mixed origins from Asia and Canaan. 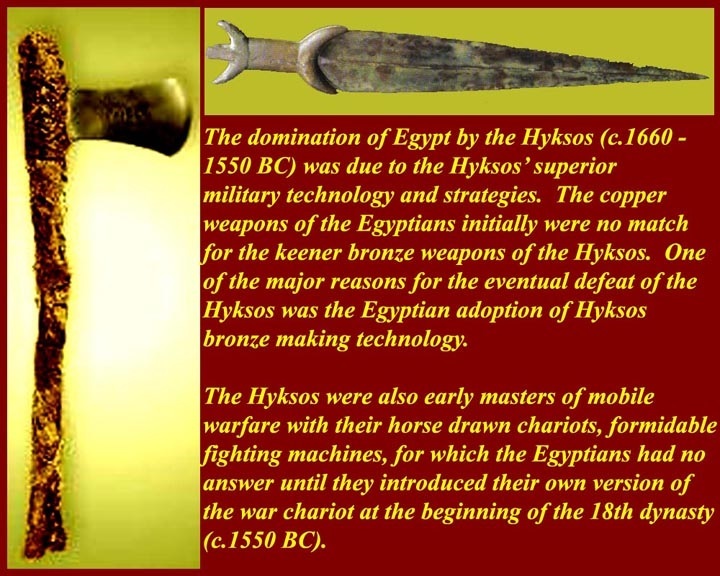 The Hyksos led to the end of Egypt’s Thirteenth Dynasty (1803–1649 BC) and initiated Egypt’s Second Dark Intermediate Period (1674–1549 BC). Egyptian texts list different tribes of nomadic groups wandering the deserts of Arabia collectively called “Shasu”. One of these groups, is identified as “Shasu Yhw(h)” This group of nomads are indeed the Jews and their deity YHWH. 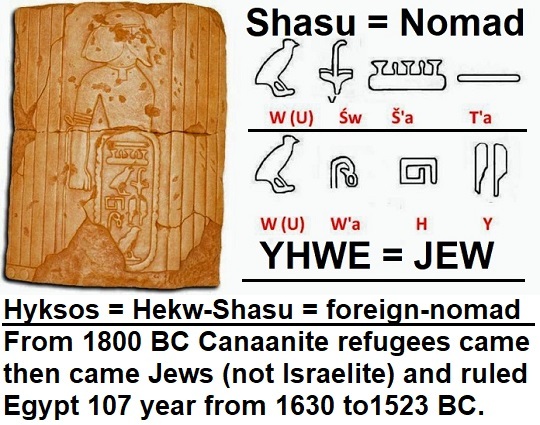 “Shasu of YHWH” means “nomad JEW”. 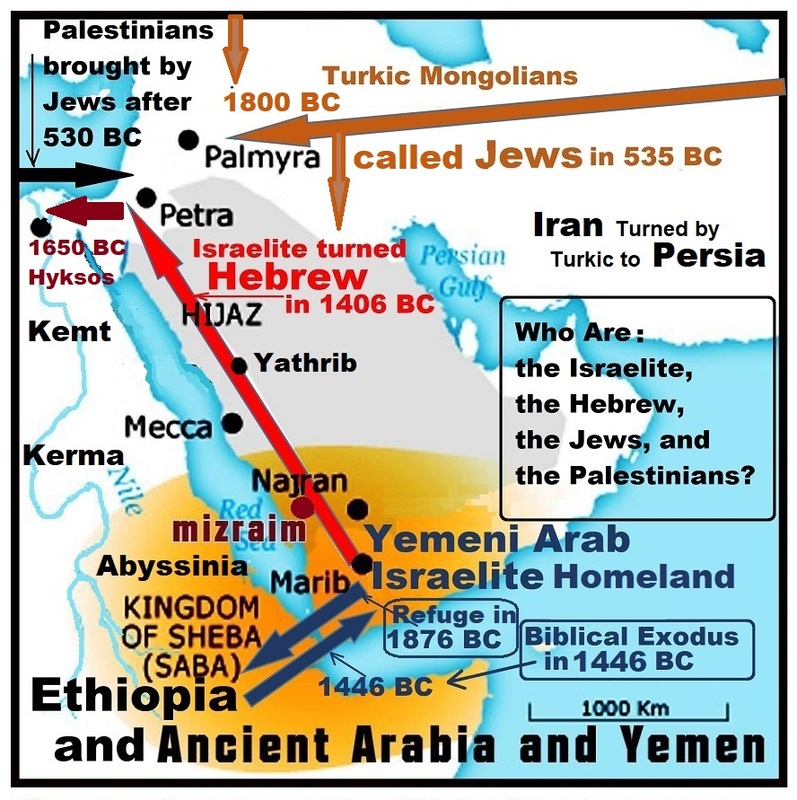 After 1406 BC Canaan was first settled then colonized by Yemeni Arab Semite “Hebrew Israelite”. Egyptians called them “Abiru or Habiru” and their only God for thousands of years was EL. “EL” is the name of the God of Moses and for the Hebrew Israelite since their Exodus. It is also written in plural “Elohim” as a form of high respect and reverence. It was the same name used by Abraham and Enoch. The Israelite also used to call God as Eloah, Ilah, and Allah. The patriarch Jacob was given the name Isra-EL 400 years before Moses and 1500 years before Jews took over Canaan. Nomad Jews, “Shasu of YHWH”, were pagans of an Asiatic cult, most probably Tengrism. The Israelite and the Jews are indeed two totally different nations with two different gods. Ahmose I (reign 1549 -1524 BC) liberated Egypt from the Hyksos. He was ten years old when he assumed the throne. Both his father and his brother died fighting the Hyksos. 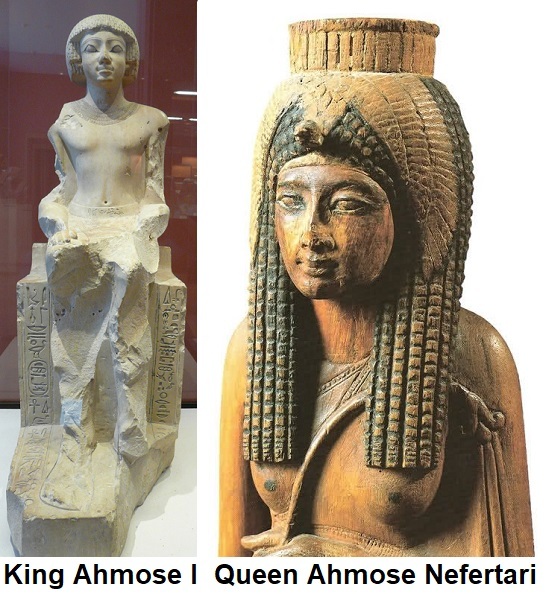 His mother, the powerful Queen Ahhotep, acted as his co-regent for the early part of his reign and retained a great deal of influence with the king. He relied heavily on sister-wife (Queen Ahmose Nefertari) and his grandmother (Queen Tetisheri) for support and honoured their names. He introduced new tools of warfare most notably the composite bow and the horse-drawn chariot and bronze tools. Inside his pyramid the pharaoh appears in a series of battle scenes which include some of the earliest depictions of horses in Egyptian art. The early years of his reign were fairly quiet, and the Hyksos may even have made some gains. However, he resumed hostilities about half way through his twenty-five year reign launching attacks on Hyksos strongholds including Memphis and Avaris and retaking Heliopolis. He laid siege to the Hyksos fortress at Sharuhen for six years, at last forcing them to retreat. The king then led his army to Nubia (Kush) imposing his control as far as the Second Cataract and installed a Viceroy in Buhen to manage the area. While Ahmose I was in Nubia, Hyksos sympathizers led by Teti-en tried to seize the throne. However, his mother (Queen Ahhotep) quashed the rebellion and maintained power until the return of her son. For her bravery, the Pharaoh awarded her “the gold flies”. The king then returned to Canaan, pushing as far as the Euphrates, to make it clear who was in charge. On returning home, he seemed content to allow local governors to get on with their jobs, rather than imposing central authority. Ahmose I married his sister, Ahmose Nefertari (the daughter of Ahhotep I and Seqenenre Taa II), their son was Amenhotep I. As well as honouring his mother, the king respected his powerful sister-wife. She held the title, “Second Prophet of Amun”, an exceptional rank for a woman, and he gave her the title “God’s Wife of Amun”. This begun the convention of naming the chief wife of the pharaoh by this title. The Turkic Mongolian Jews of Shasu kept on plundering from India up to Rome and they caused the Late Bronze Age Great Collapse in 1177 BC and the Sea People crises. Finally, they turned against their Hebrew Israelite allies and displaced them in 530 BC. Finally the Jews and their deity YHWH won over the Hebrew Israelite and replaced their God EL. Moses was from Yemeni Arab Israelite parents, born and grew up in Abyssinia (ancient Ethiopia), married and had two sons from a Nubian, and died in Yemen. These are certain. The Jews (Turkic Mongolians) appeared hundreds of years before the Israelite moved to Canaan in 1406 BC. 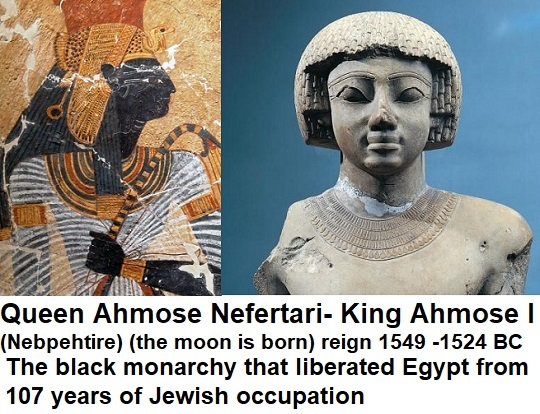 The Campaigns of Ahmose (the great) in north Egypt was against the Jews; and to the south in Kerma (ancient Nubia) was against the Israelite. 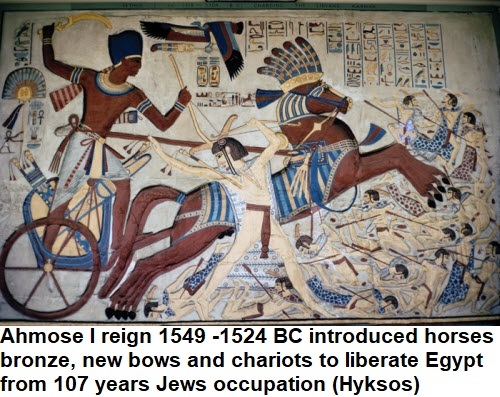 These happened 90 years before the Exodus and 150 years before going to Canaan and becoming Hebrew. The old puzzle has been solved perfectly. The truth will set the peoples of the world free. Very interesting information: Eager to know more information regarding the Pyramids of Egypt and their connection with the Kings ruled Egypt. What was the religion at that time of these kings. I am also interested to know about the great flood that caused many countries and islands to disappear. Yes, we need to get truth in religious thinking instead of damned tribalism. Religion has been a mixed blessing. Interesting that you have deleted so many thoughtful comments. One has to wonder WHY? I don’t delete comments unless they are irrelevant or indecent.